Coronary artery bypass grafting (CABG) is a surgical procedure for ischaemic heart disease, which is the most common cause of death in Western countries. In this disease the gradual build-up of fat and calcium within the arteries of the heart causes them narrow, which reduces the blood flow to the heart’s muscle. When the narrowing becomes very severe or completely blocked it causes a heart attack. CABG involves bypassing these blockages using a graft. 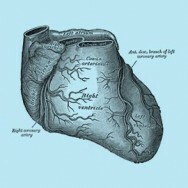 The graft goes around the blocked artery to create new pathway for oxygen-rich blood to flow to the heart again. The aim of this is to relieve symptoms (including angina), help you resume a normal lifestyle, and to prevent the risk of heart attacks or other heart problems. Usually the sternum (breast bone) is divided to access the heart. Alternatively, new technology enables CABG to performed through either a 5-10 cm horizontal incision (called mini-thoracotomy) on the left side of the chest (“minimally invasive direct” CABG, MIDCAB), or through keyhole surgery (called “totally endoscopic” CABG, TECABG) with the assistance of a surgical robot. The smaller incisions used in these operations are shown in Figure 1. The surgical robot that Sydney Heart & Lung Surgeons perform TECABG with is called the da Vinci Surgical System (Figure 2). Not everybody is suitable for minimally-invasive CABG, so you should discuss this with your surgeon. Minimally-invasive CABG has similar risks to traditional open-chest CABG, including wound infection, bleeding, kidney injury, stroke, heart attack, and possibly death. With minimally invasive surgery there is also the risk that procedure needs to be converted to the traditional open-chest method. All patients should consult their cardiothoracic surgeon for specific information about their medical condition and surgery. Systematic review of robotic-assisted, totally endoscopic coronary artery bypass grafting. Seco M, Edelman JJ, Yan TD, Wilson MK, Bannon PG, Vallely MP. Ann Cardiothorac Surg. 2013 Jul;2(4):408-18. doi: 10.3978/j.issn.2225-319X.2013.07.23.